The 3 Spring Trapeze System brings a whole new dimension to your yoga swing experience; and makes it easy to mount your yoga swing too. This little innovation gives a comfortable bounce to the action you create on the swing. The bounce feels good and it also gives your stabilizer muscles more to work with. Your muscles are going to fall in love with this stimulating experience. When you first try it out you might be shaking a round a bit, but soon your muscles will learn to control this, which is good for your body and your mind. You’ll improve your balance. The trapeze system won’t only add bounce to your yoga swing; The olympic swivel suspension allows spin action as well. The 4 ring pull up bar has 2 cushy grips to hang from and offers versatility for hanging your yoga swing sling. The safety clip hooks make it easy to adjust the sling from a broad spread of 14 inches down to a single ring in the center. around the fabric, for when you’re doing inversion (hanging upside down) poses and exercises. 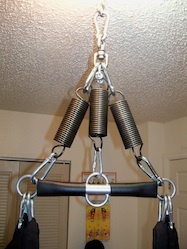 The Yoga Swing Trapeze System Makes Hanging Your Yoga Swing A Snap. There are 7 safety spring hooks on your trapeze system. The one at the top of your trapeze system, which is attached to the swivel, allows you to connect your yoga swing to a single point, as opposed to 2 Daisy Chain Nylon Straps. The most convenient place to hang your yoga swing and trapeze system is a Rock It Stand, but there are other options as well. You can use a heavy duty rope attached to a beam in your house; or a tree. You can also attach to an eye bolt, like the one in the video below. Make sure you have someone who knows what they’re doing install it safely for you, if you go with this option. 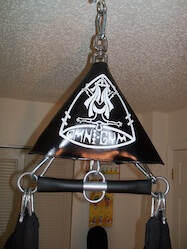 Carve Your Perfect Body With The Omni Yoga Swing. Previous post: What is the Omni Yogaswing? Get Your Yoga Swing Here.